All those mice did a fantastic job, didn't they? What a dress they put together for Cinderella while her step-sisters bossed her around. She looked magnificent! Wouldn't it be amazing to have a team of rodents to make all your clothes for you? Well, in the 1960s, the CIA attempted just such an experiment (yes it's true, there's no need to google it to find out if we're making this up or not. Obviously we wouldn't do that). It turns out mice are terrible at making clothing of any kind, but they are very good at squeaking. Researchers left the mice locked in a room with sewing supplies for one week. Upon entering the room, they discovered a horrible mess, and the mice hadn't made a single article of clothing. The $3 billion project was abandoned. 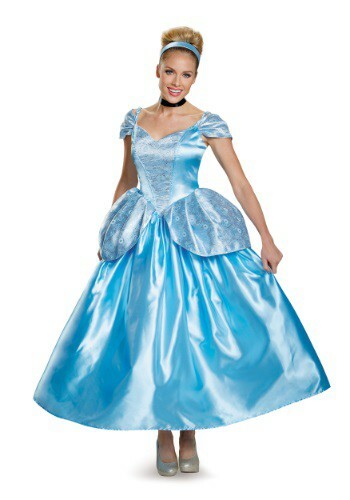 Fortunately, Cinderella doesn't have to worry about mice with terrible tailoring talent. That's what her fairy godmother is for! That's right, with a bibbity-boppity-boo, Cinderella looks as though she really did have magical mice helping her look her best. Nope, just fairy godmother. If only we all had one of those, right? Life would be so much easier if someone would show up once in a while and give us a magic fix out of a pumpkin. Well, your magic fix is right here because this gorgeous dress is one thing that won't disappear on you at midnight. It's a stunning ensemble you'll feel like royalty in a structured bodice, built-in petticoat, and a princess seam to add structure. In fact, you can wear it again and again and this time you'll dance the night away! Note: Magic mice, fairy godmother, pumpkin coach, and horrible step-sisters not included.